They held cardboards indicating and explaining that it was just a theatre. While inout9ja Blog was speaking with one of the students; Amodu Aramide, she narrated that it was theatre, he did nothing wrong and was fun. 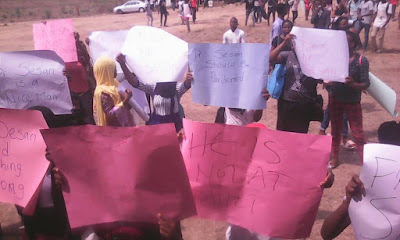 On the cardboards, they plead that Dr Sesan should be pardoned for any misconception. More details later to come as students have gone outside the school to further express themselves.